These railings are another good example of negative ornament; but for the mortar joints, they look as though they'd been carved from monolithic walls. A vivid contrast of both color and gloss. 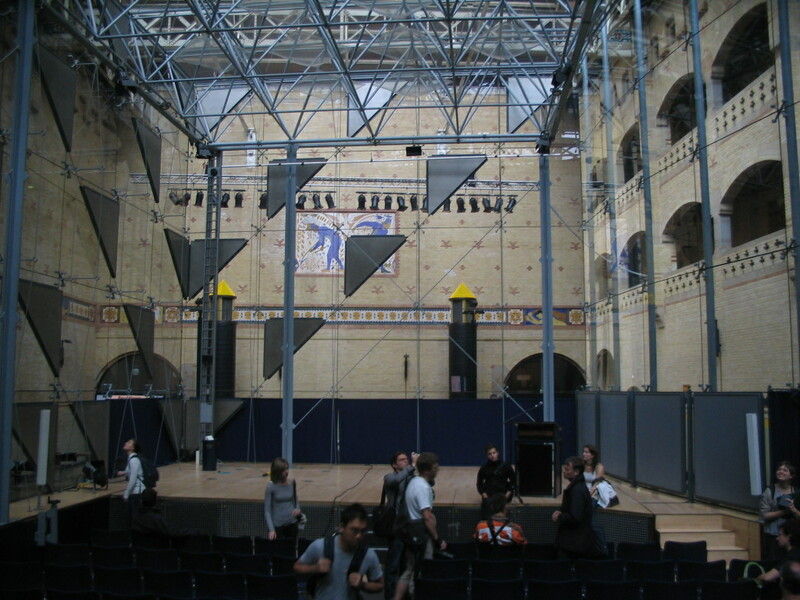 The grand space and structure of the main exchange hall, the Goederenbeurs, if we go by this floor plan. 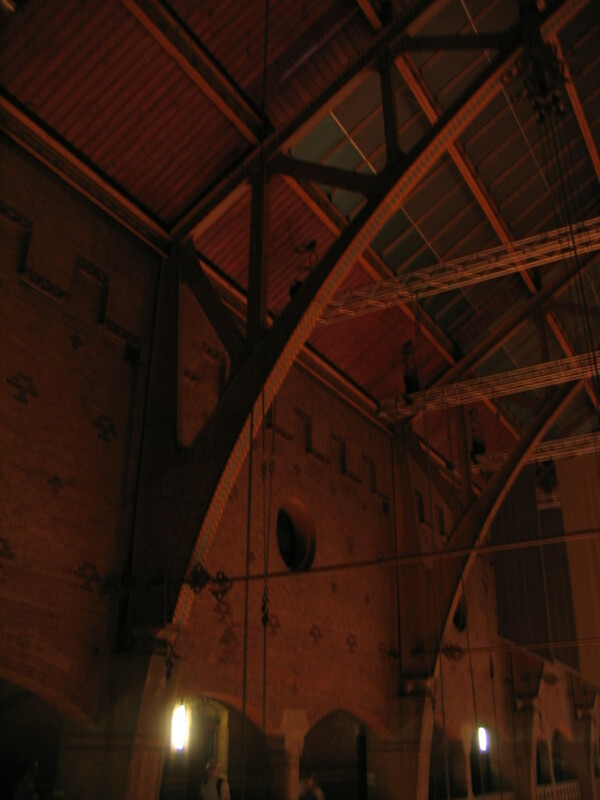 The Beurs is now an exhibition and performance center — which means that the socialist Berlage's dream for the building as a "Palace of the People" has essentially been realized, albeit by moving the stock exchange functions somewhere else rather than through the dissolution of the capitalist system! 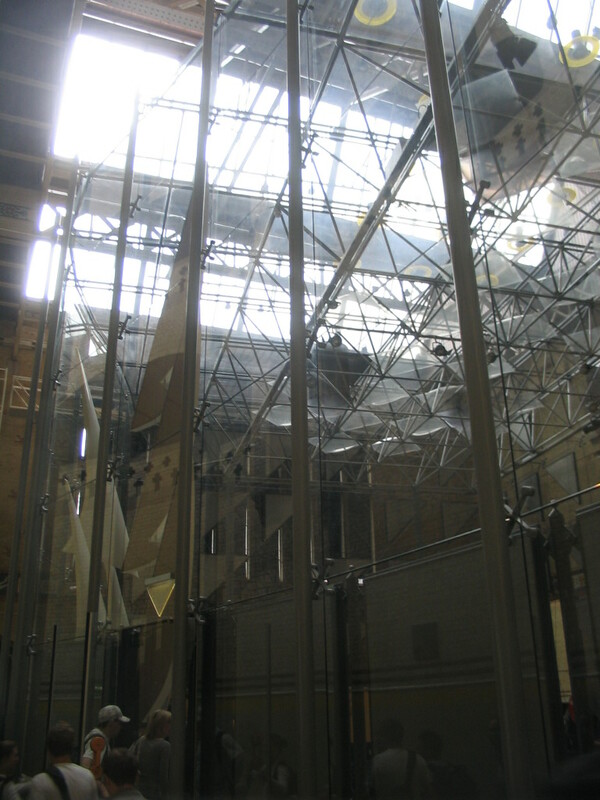 Truly this is a structural rationalist's dream. The continuation of the curve from the metal arches into the stone abutments carrying them is incredibly satisfying. 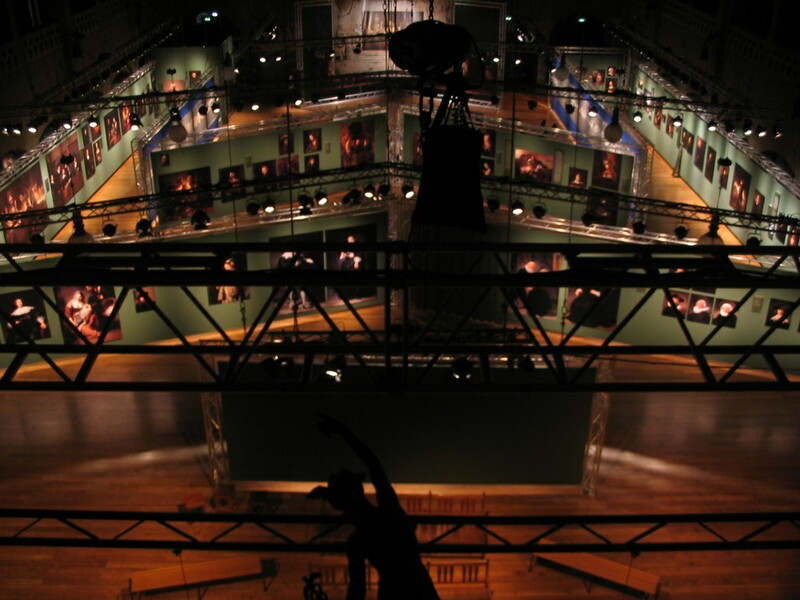 One thing I found unfortunate is that the glass roof of the Goederenbeurs was shaded for the sake of the exhibitions. 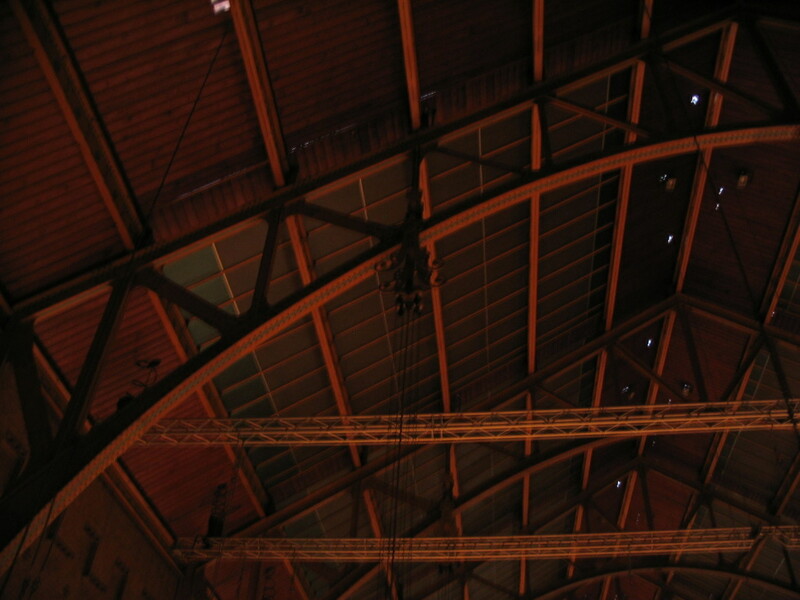 I would love to be able to see it with the daylight streaming in. 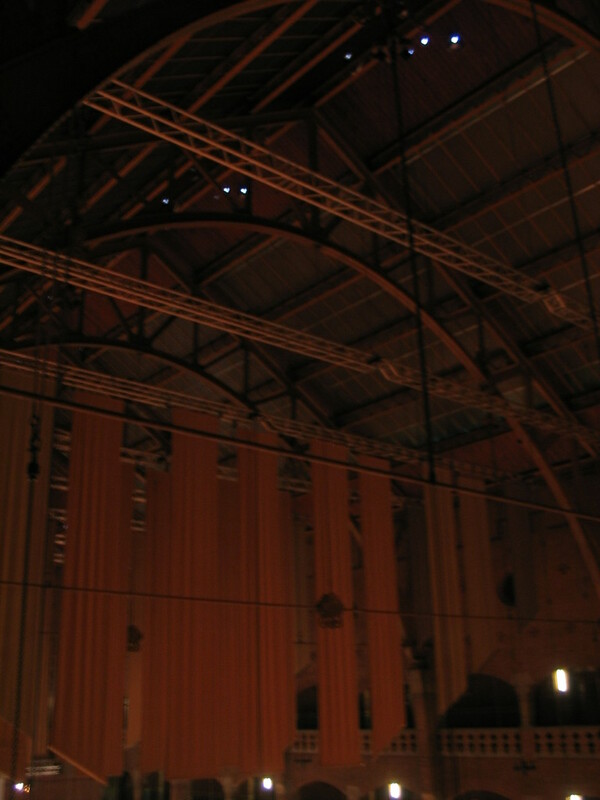 The grand array of windows at the southern end, illuminating a smaller but still grand chamber. 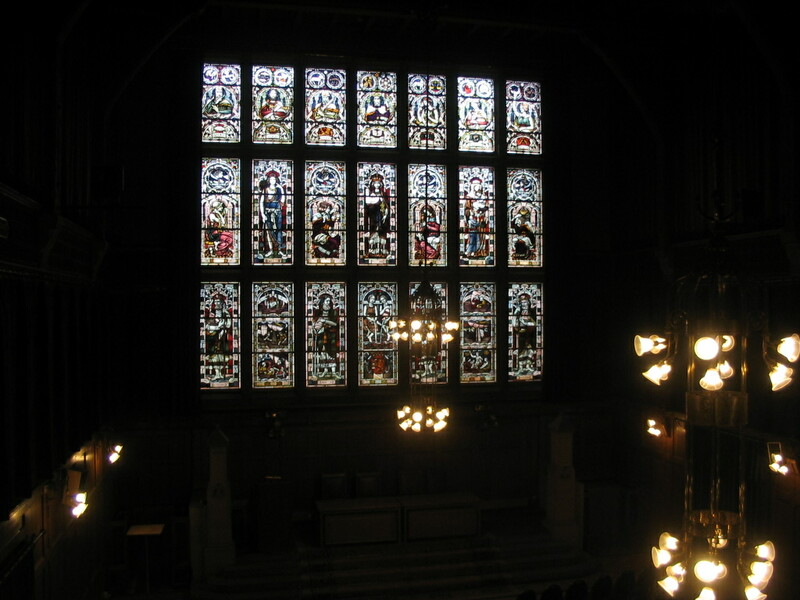 I don't remember who the figures depicted in the windows are. 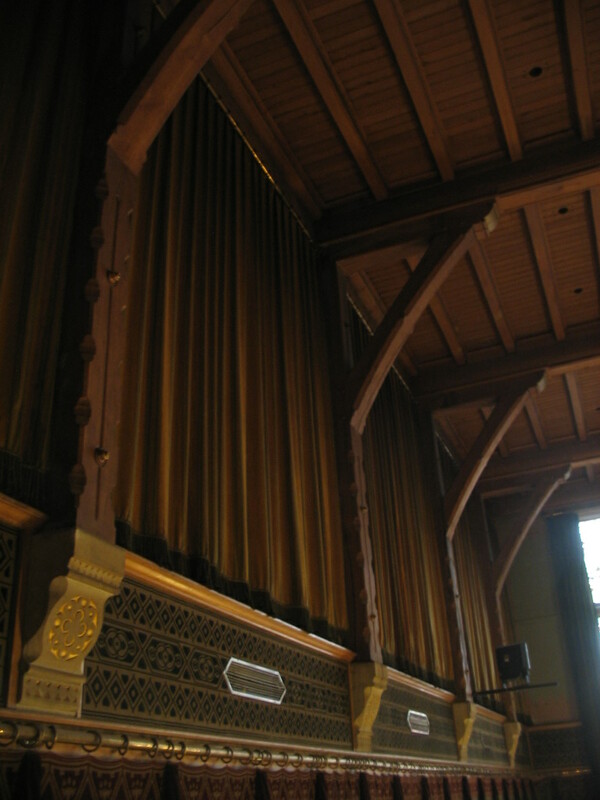 The side wall of that chamber, rather more rustic than the Goederenbeurs. 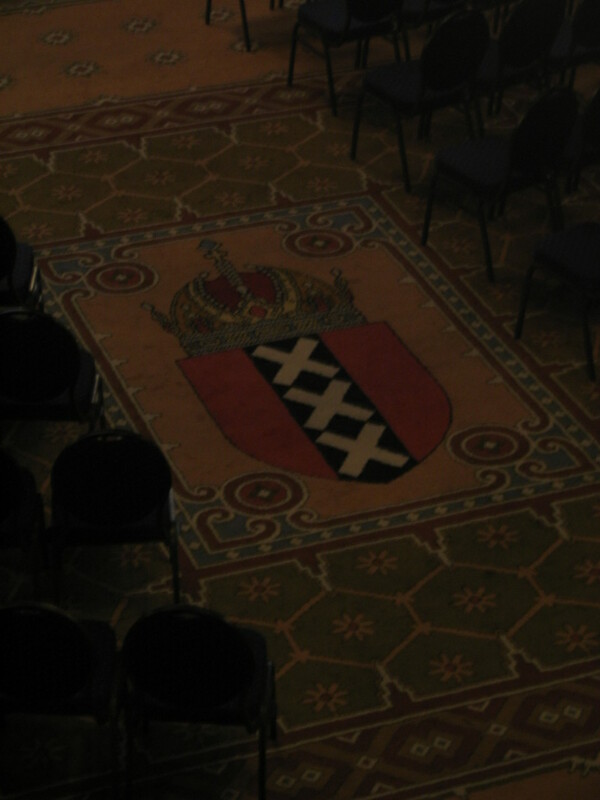 The Amsterdam coat of arms at the epicenter of the chamber's carpet. Thence we headed north toward the Graanbeurs. 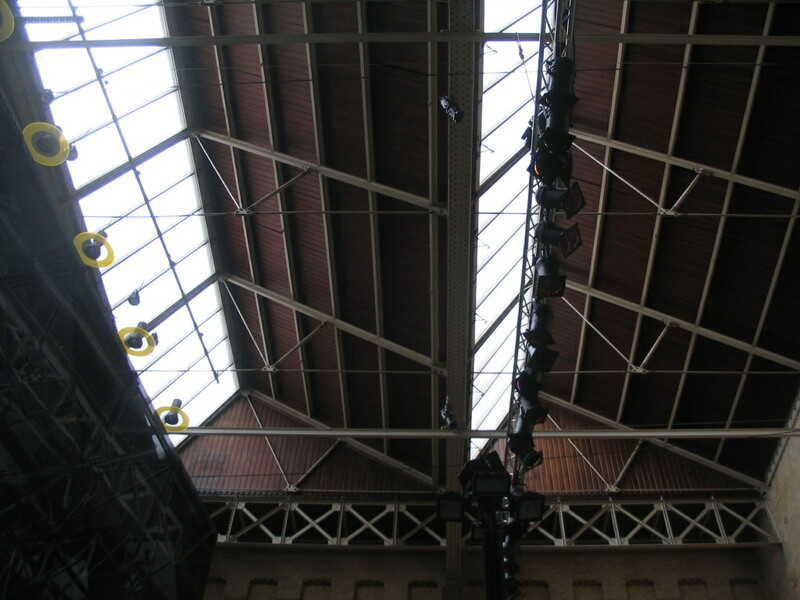 Thankfully, the Graanbeurs's skylights are still permitted their function. 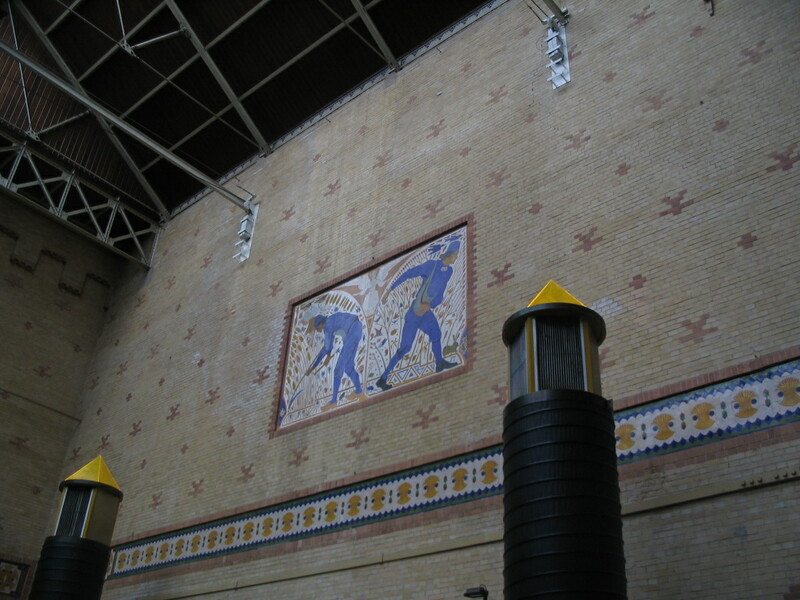 Throughout the building are murals exalting the proletariat, apparently a good means of annoying the commodity traders who worked there. 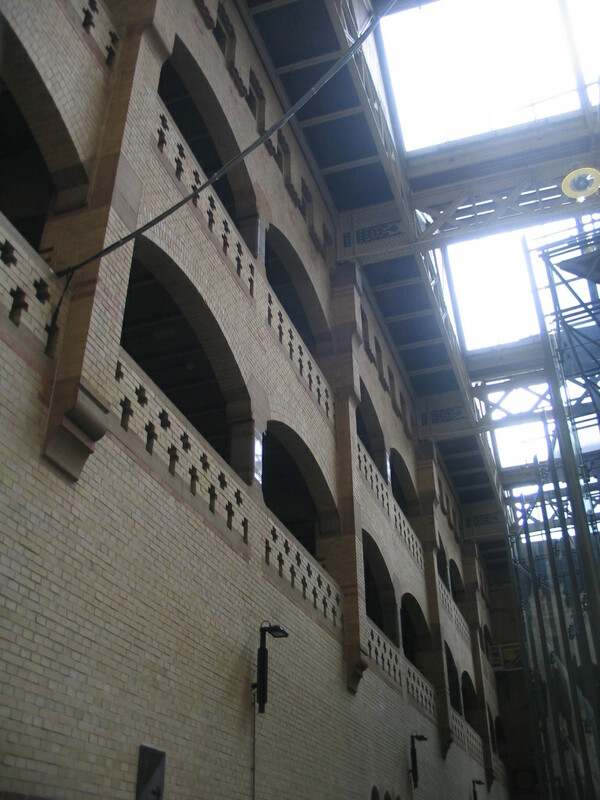 The walls of the Graanbeurs are simple planes except where piers protrude to support beams. 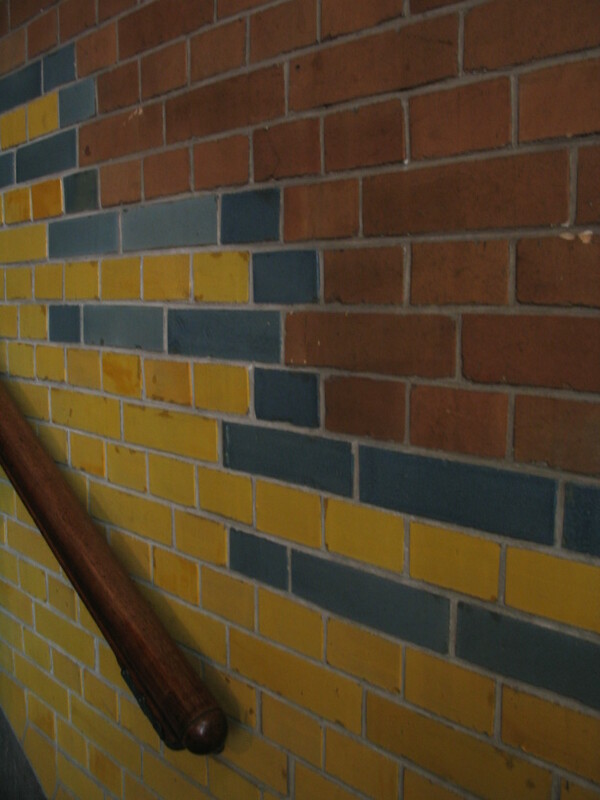 I really like the inlays of the various materials in the wall plane. 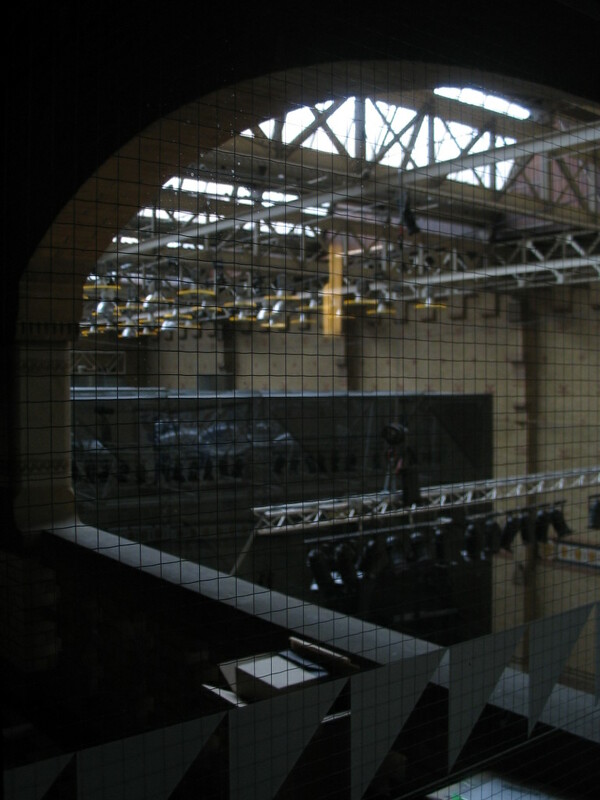 Embedded in the Graanbeurs is this glass chamber providing acoustical enclosure for a performance space. 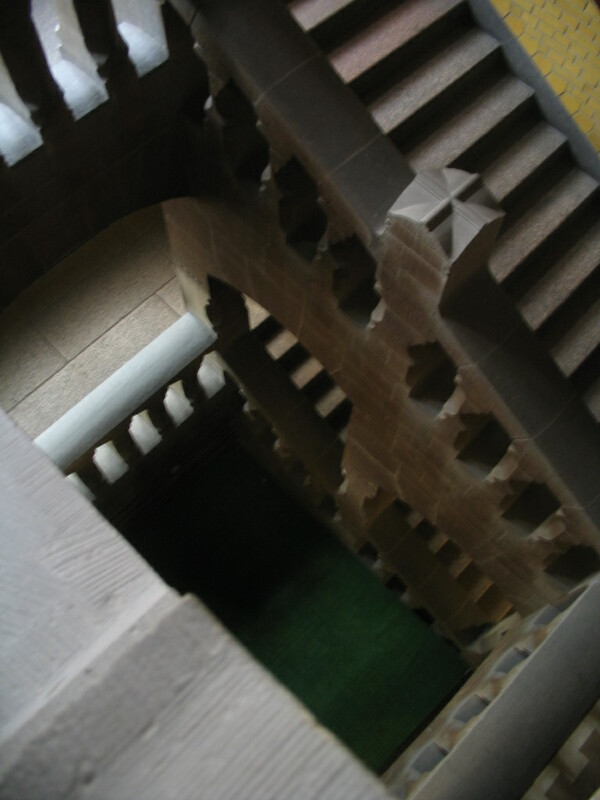 Quite different in detailing from the surroundings, but rather concordant with them nonetheless due to its own fully expressed structure. 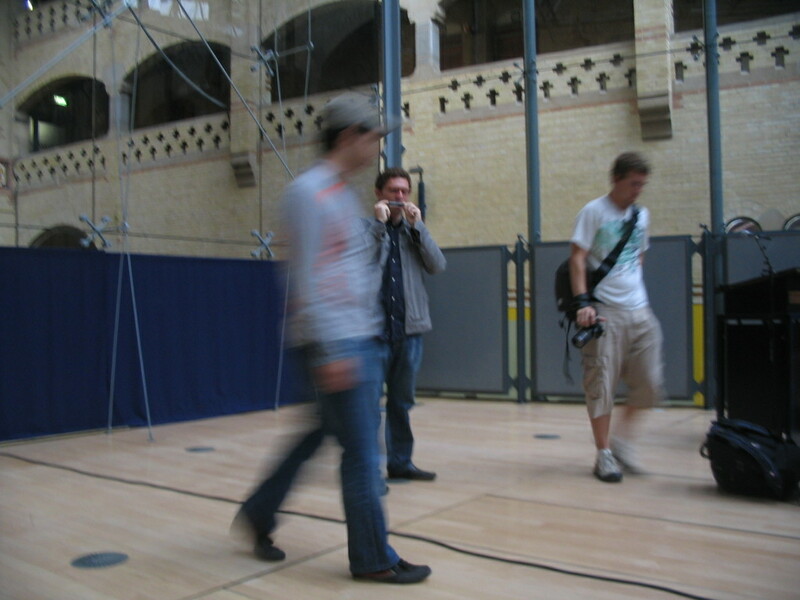 Jonathan tested the acoustics with a harmonica concert. 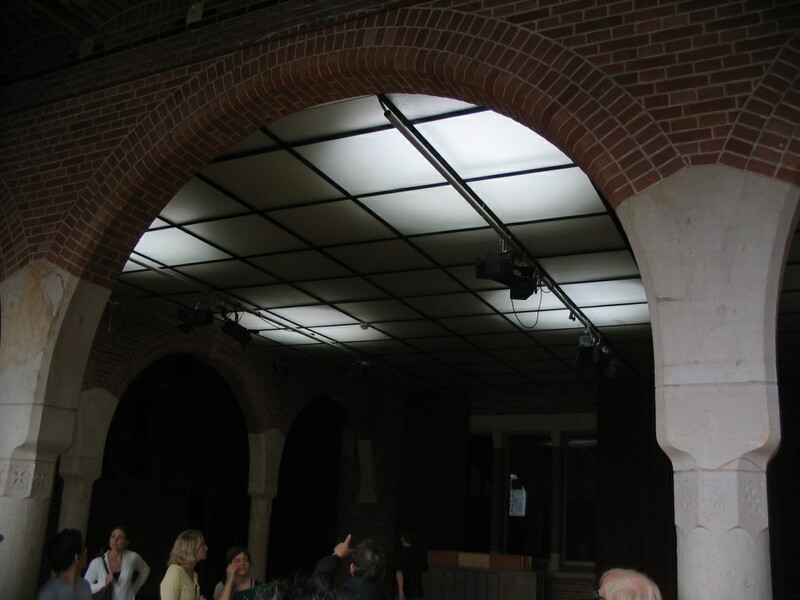 This room is at the north end of the Beurs, I think, judging by the horizontal daylight.